David Luiz's future remains in doubt with Chelsea reluctant to change their policy of only offering players aged over 30 one-year contract extensions. Chelsea are hopeful Antonio Rudiger will follow N'Golo Kante, Marcos Alonso and Cesar Azpilicueta in signing a new contract, but the German's central defensive partner Luiz is entering the final six months of his deal. Luiz, who scored and starred in Chelsea's 2-0 victory over Manchester City , has reaffirmed the fact he wants to stay at Stamford Bridge. But the 31-year-old wants more than the one-year extension that has been offered to him and knows he could get a longer deal elsewhere. It is expected Luiz will start receiving offers from foreign clubs in January, when he can start negotiating a summer move. As things stand, unless Chelsea review their policy, it is believed he could leave the club at the end of the season. 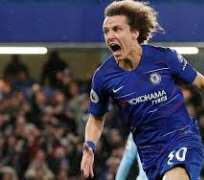 Luiz, along with Chelsea's other goalscorer Kante and captain Cesar Azpilicueta, was excellent against City after being rested for the midweek defeat to Wolverhampton Wanderers. “I hope, I hope, I hope so,” said Luiz. “But I also know they are a fantastic team and they accept to lose sometimes too because they have experience of that. But I hope we hurt them and we can move up the table and be closer to them. “At the moment they are the best team in the world, more than three years together. It is never easy to play against them, but I think we had the right humility and right plan to win the game. Sarri has been confused by the mentality of his team and Luiz admitted that the quality of City's attackers helped to concentrate minds in the Chelsea defence. Alvaro Morata was left out of the Chelsea squad, as Sarri also decided to play without a traditional striker. Eden Hazard was deployed through the middle and assisted both goals, with Olivier Giroud on the substitutes' bench. Morata was at Stamford Bridge to watch the game and took part in a warm down after the final whistle. Surprisingly, Luiz claimed he would have preferred to go up against Sergio Aguero rather than Raheem Sterling, who played as a false nine.